This is the scene at the start of the trail to Schwabacher's Landing on the Snake River near Jackson, Wyoming. 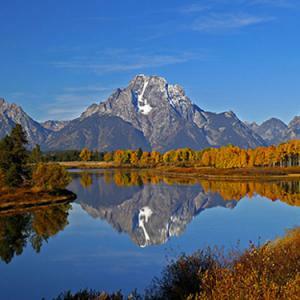 The majestic Grand Teton mountains are covered with snow in the background with a cold blue sky surrounding them. This is the early winter scene at Schwabacher's Landing on the Snake River in the early morning by Grand Teton National Park. The dusting of snow on the Grand Tetons, ice on the river and clear blue sky makes you freeze in the below zero air. It took three weekends to finally get all three ingredients together for this photo; no wind, some clouds, and salmon color as the sun rose. This is the famous scene at Schwabacher's Landing in Grand Teton National park near Jackson Wyoming where people from around the world come to photograph. This is the same location as 07-02, but if you are patient enough to wait for the setting sun, you will be rewarded with the salmon color at dusk. Cold clear skies and a trek out into an open field in near Squirrel, Idaho sets up an old barn against the backdop of the Grand Tetons for a great winter setting. A perfect reflection of fall colors and Mt. Moran offer a great panorama photo at Oxbow Bend on the Snake River in Grand Teton National Park, Wyoming. You need to be at Oxbow Bend on the Snake River early in the morning before the wind starts in order to get a perfect reflection of Mt. Moran. Here the fall colors add to the beautiful scene. The morning sun is the light light you want to take the photo of Turret Arch in Arches Natioanl Park, Utah. The eastside of the North Window Arch in Arches National Park, Utah makes a spectacular frame for the Turret Arch in the morning sun light.